The February 2014 Greater Atlanta Coin Show sandwiched itself between two winter storms. Many dealers and visitors could be overheard sharing their trials and tribulations of the January 28/29 snowstorm that brought the area to a standstill. As a reprieve, the Sunday show enjoyed some partly cloudy, partly sunny skies with temperatures in the low 60s. Then, just two days later, Mother Nature sends freezing rain, sleet and snow to our southern climes. This time, the area looked like a ghost town with people huddled inside. We hope you and yours stayed safe and warm. Here's a huge THANK YOU to the many people and the many new faces that joined the dealers at Sunday's coin show. Here's another big THANK YOU to all of the dealers that participated in the show. Of particular note, a few of our dealers traveled back to the Atlanta show from the Charlotte coin show. Our thanks go to everyone that contributed to the success of the February coin show. On the bourse, gold continues to be popular at the coin show. This month, the bourse included a rare five-piece set of gold Pandas. The set contains one each of the one-ounce, 1/2-ounce, 1/4-ounce, 1/10-ounce and 1/20-ounce gold Chinese Panda coins. The coin show's bourse also saw a large collection of GSA CC (Carson City) dollars. Make plans to visit the next Greater Atlanta Coin Show on Sunday, March 16, 2014 with its coin dealers packing the bourse with their displays filled with coins, currency, jewelry and other collectibles. 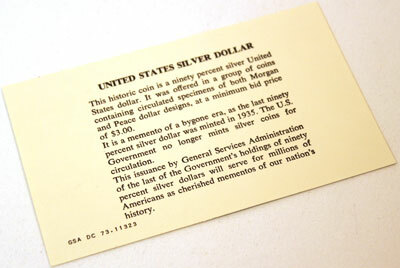 Back in the early 1960s, the US Mint found a cache of silver dollars, both Morgans and Peace dollars. Many of the dollars were circulated but still desirable to collectors. Others were almost mint condition, and some had the Carson City mint mark. Many of these coins were distributed by the General Services Administration. Here's an example of an 1883 "O" (New Orleans) Morgan GSA Dollar. For comparative value, the CC GSA dollars and GSA dollars with less wear than this 1883 "O" example would be much more valuable and desirable to collectors. For another example on the bourse, two nice, and rather rare, counterstamped Stone Mountain Memorial commemorative silver half dollar coins changed hands. One was counterstamped with the abbreviation for Oklahoma while the second showed an abbreviation for Georgia. 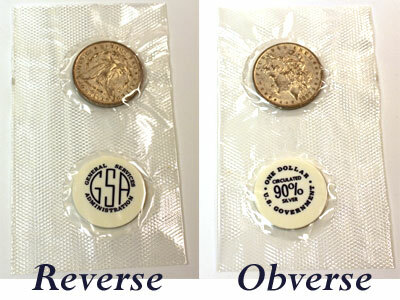 Oddly, in most cases, numismatists prefer their coins unaltered after they leave the mint. But, back in the 1920s, the United Daughters of the Confederacy sold versions of the Stone Mountain commemorative coin with numbers and state abbreviations that were somewhat crudely stamped on the back of the coins. Some numbers were randomly chosen while others represented the number of the local UDC group selling the coins. These coins commanded a higher price originally and frequently retain a higher value today. For more information on the counterstamped Stone Mountain coins, find a copy of the August 1987 issue of the ANA's The Numismatist. It contains an article by Adna G.Wilde titled "Counterstamped Stone Mountain Half Dollars, Where Are They Today?" 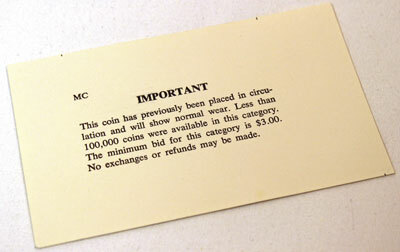 The set included an "IMPORTANT" note describing the coin's category. 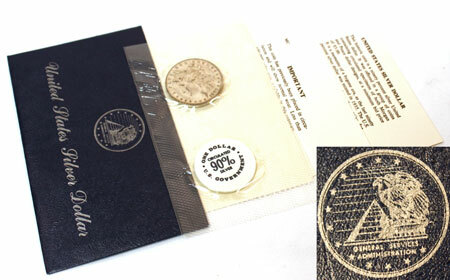 Instead of US Mint or Department of the Treasury emblems as seen on mint collectibles, the face of the envelope contains the GSA symbol. In addition, the set also included another note briefly decribing the coin's history. They sealed the GSA dollar into a clear package along with a plastic token.